Finding my NYE outfit every year is always my favorite thing. All the bold and sparkly pieces the stores have out always have me like 😍 It's so hard to choose! Typically I like to find pieces that I'll wear all year round, not just for a few hours one night. I'm all about affordable fashion and putting my money towards pieces I'll get use out of. Finding this years outfit was so hard though. Tyler and I already decided we were going to spend our NYE having a dinner date then heading over to our favorite winery for the night.. we're not a fan of the crowds/rowdiness, so we picked somewhere with laid back vibes. So I wanted to find an outfit that I would be comfy in all night, but still be able to make a statement and once again, Old Navy hit the mark with everything! These pants were an obvious choice to ring in the new year. Their pixie pants are comfy as is, but this print?! Adorable and so fun. I decided to style them with a black tank and this gorgeous velvet blazer. However, I already have plans of styling them with a cozy black oversized sweater and some flats for a more casual look. Unfortunately these pants are sold out in every size but one, but they are available in tall and plus sizes! They're the perfect holiday, work, and party pant so if your size is available snag them up quick! Today I'm sharing with you guys my favorite sweater. I've raved a lot about them on Instagram, only because they're amazing! I first spotted them on Black Friday for a great deal and after I came home and tried it on I bought two more. I mean when you love something buy it in every color, right? 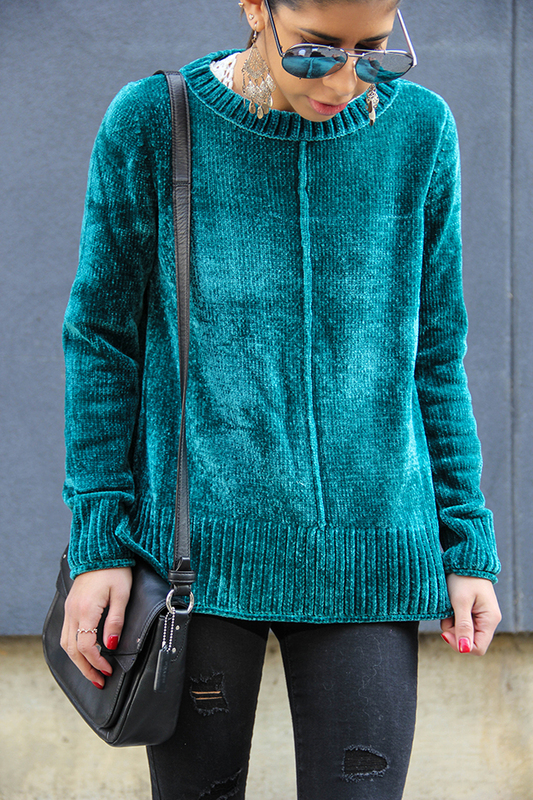 The material is thick and soft, making it the coziest item in your wardrobe! I love a good casual look so I styled this one with my favorite black denim and a pair of sneakers. 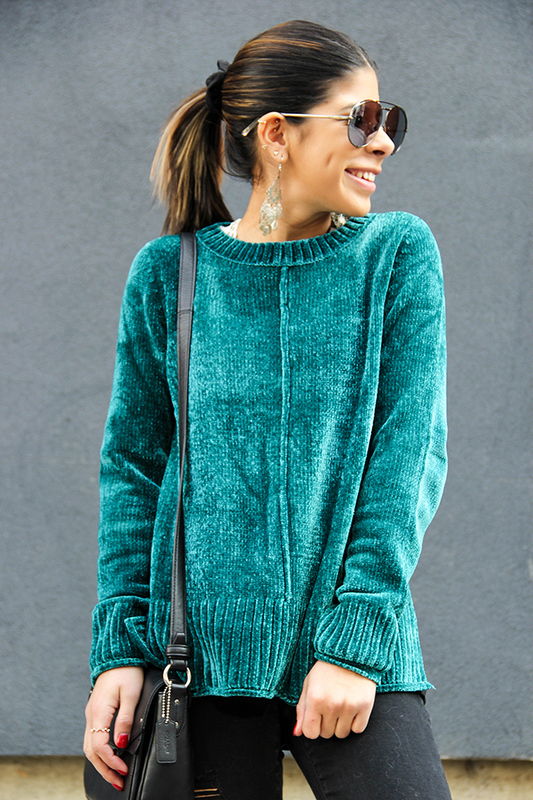 The emerald color paired perfectly with the black denim! I've styled these sweaters so many other ways, which is the great thing about them--they work for any occasion. I've styled them with fur slides, flare jeans and heels, and even layered it with a long sleeve. I went to New York this past weekend and ya'll, it was C O L D! I love traveling to New York during this time because I like to go see the city lit up (even if it's the same thing every year). The one thing I don't like tho is trying to figure out something to wear that will be both warm and cute, which typically isn't easy. At one point I kept contemplating if I wanted to sacrifice being cold to be cold or vice versa. Finally, after making a huge mess, I put together a look that fit both things so I wanted to share some tips for you to layer up this winter when visiting your favorite cities! The more shirts, the better.. trust me. When I'm going to be outside all day I make sure to pick a top that'll allow me to wear shirts underneath. I always wear a tank top, one (or two depending how cold) long sleeve shirts, then put a sweater over it all. It may sound crazy but it's kept me warm every year when traveling to cities in cold weather. I live for my fuzzy socks, so when I wear boots I always grab them. If you're going to be outside walking all day, try to base your outfit around a comfy pair of shoes. It's never a fun time when you're an hour into your trip and you're already regretting your shoe choice. Over-the-knee boots are my favorite wintertime shoe and also my rain boots! The amount of layers you need depends on the coat you want to wear. For instance, the coat I wore wasn't the heaviest, so I made super to layer as much as possible. Since I went for an all black/white color scheme I added some color/designs by grabbing my red pom beanie and cheetah gloves. Always bring along a hat and gloves even if you think you won't use them, because chances are you'll end up using them. I also added a scarf for extra warmth! By the end of the night I had it wrapped around my face, lol. My Christmas outfit this year!